“In the chocolate box of life the top layer’s already gone. And someone’s pinched the orange creme from the bottom”…During the 1970s, a number of successful television sitcoms were given the big-screen treatment with varying degrees of success. 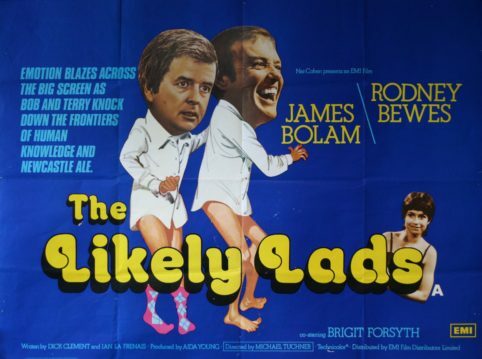 The Likely Lads is one of the best examples of the genre, and for my money it’s actually superior to the television series, which did suffer somewhat from an obviously miniscule budget, occasionally poor acting from the supporting cast and a vaguely under-rehearsed feel…Drinking partners Bob Ferris and Terry Collier, lifelong friends since their schooldays (and juvenile court appearances), are both somewhat disturbed at the sweeping changes being made to the city where they grew up. Terry’s street has recently been demolished and his family rehoused in a high-rise apartment block in a crime-ridden area; Bob is depressed because one of his favourite pubs is being knocked down. The grimy streets and houses of their youth are fast being replaced with concrete canyons, car parks and motorways. Add to this startling social upheaval the fact that ‘respectable’ Bob is undergoing a bout of existential angst akin to a severe mid-life crisis, and eternal wastrel Terry is equally unsure of his future beyond the next pint and the next passionate encounter with his latest “conquest”, and you have the backdrop for one of the most thoughtful and unusual comedy films of the 1970s, mixing extremely funny set-pieces (Bob’s flight of fancy during the bridge game, Terry’s noisy urination up the side of the caravan, the loudly-broadcast argument in the washing powder promotional van) and genuinely witty dialogue with a genuinely sobering undercurrent of bleakness and despair. If you can imagine Saturday Night And Sunday Morning redrafted by Mike Leigh, then The Likely Lads is a similar sort of proposition. Printed in England by W.E.Berry Ltd. Bradford.